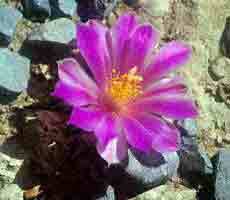 Ariocarpus kotschoubeyanus LRM51, the smaller northern form growing near Hipolito. Ariocarpus kotschoubeyanus is found over a wide range, the more northerly 'macowellii' type illustrated here is characterized by smaller growth, and paler flowers than the more southerly 'elephantidens plant. 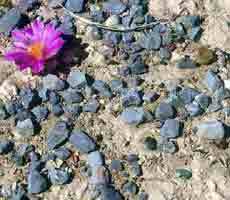 The species often occurs in vast numbers, but is virtually impossible to see in the dry mud when not in flower. 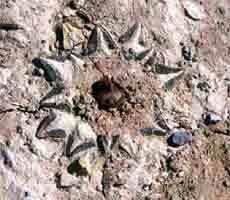 The plants shown here are growing within 2 metres of a road, the grey gravel is not natural, but is stone from the road which has been scattered over the colony.